In the past few weeks, I’ve gone from a silent retreat (see previous post) to a writing retreat, where I am now, at the Seattle apartment of vacationing friends. Thanks to their generosity, I have a change of venue from my rural, island home, to the city… to write about the two years my family and I lived in the remote mountain village of Stehekin, WA. I’ve schlepped journals with me here to freshen memories of that time seventeen years ago as I work on the rough draft of a book-length memoir. Yesterday, I re-read pages I had written that snowy first winter in Stehekin. 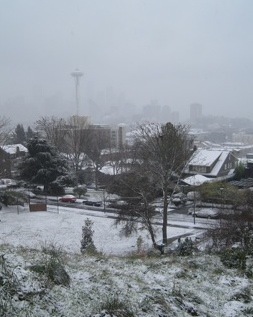 Snowfall outside the Seattle apartment transported me back to that time when inches and inches of snow slowed and focused my journey inward. Questions about the work God called me to accumulated on the pages as the snowdrifts grew outside. Prior to our move to Stehekin, much of my identity had been tied to work as a public health nurse, caring for infants, children, and women with high-risk pregnancies. That work had fed me for many years, had brought me satisfaction and gratitude that I had been led to help others. After about twenty years, though, I was drained. Day after day, in the privacy of our mountain cabin, I peeled away layer upon layer of uncertainty about my work and my worth. I carried out assignments in Julia Cameron’s book, The Artist’s Way, writing to the recognition that I was tired of taking care of others. My three pages of free-flow writing every morning became questions to God about what I was being led to and how I was to serve. The solitude and beauty of the mountains, river, and forest awakened my creativity and revealed how depleted I was. I had become a shriveled sponge in desperate need of re-hydrating with art, music, walks, reading, cooking, writing, and being with friends and family. I had expected that a few weeks or months of attending to myself would saturate my dryness, but as the days grew shorter, the snow piled deeper, and the air chilled my skin on daily hikes, I recognized not only the intensity of my exhaustion but nudges to a new calling. Could it be that God had led me to that time of healing, restoring, and renewing so that I could make music in my heart? It took me awhile, but I’m now clear that I am called to work that makes music in the heart, through listening and words and stories. My belief is that such music helps find the lost and heal the broken, and brings peace. Late Wednesday night, as snow glistened in the streetlights and powdered the sidewalks of Seattle, I received an e-mail that I’ve been accepted into an MFA in creative writing program. There, I’ll continue to write my memoir and other stories that I hope will further Thurman’s notion of the work of Christmas. Blogging update – The January/February issue of Western Friend magazine focuses on the written ministry of Quaker bloggers in the West (http://westernfriend.org/2011/02/quaker-bloggers-in-the-west/). Almost all of the content of the issue is available online, but WF editor, Kathy Hyzy, printed excerpts from ten blogs (including a post from this one). For those new to blogging (and perhaps hesitant to explore this new media), the WF print version offers a gentle introduction. Enthusiastic bloggers will find the issue a great resource as well, with links to dozens more Western Quaker bloggers and to Quaker organizations all over. Congratulations. I will enjoy holding you in the Light on this journey. Thanks, RantWoman – I need all the holding I can get!